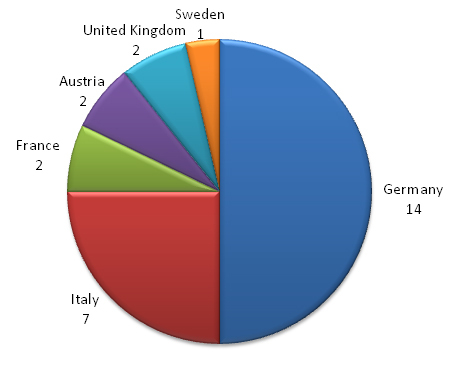 The HadronPhysics2 Consortium involves 46 beneficiaries (see Chapter B.2.2 Beneficiaries), either Universities or Research Centers, from 15 countries, among which 13 Member States (48% of all Member States) and 2 Associated Countries (Croatia and Norway). The number of represented Member States grows to 21 (which corresponds to over 77% of all Member States) and the number of Associated Countries to 4 (adding Israel and Turkey), when we include countries from the list of the 103 Other Involved Institutions. The list of States represented by the Other Involved Institutions includes also a number of International Cooperation Partner Countries (ICPCs) such as Armenia, Belarus, Russia, Ukraine, China, India and South Africa. Furthermore, the project involves institutions from Japan, Korea and the United States. Overall, 35 countries contribute to the project.This large participation reflects the blooming, still expanding, research activity in the field. Essentially all European scientists and the research infrastructures active in hadron physics have joined the proposal. 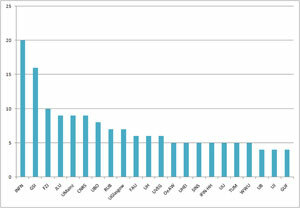 Figure 1 shows the distribution of spokespersonship of work packages among beneficiaries. As it can be seen, leadership is well distributed among beneficiaries, since 14 institutions out of 46 (30,4%) are directly responsible for one or more activities. Among these only INFN and GSI have more then 2 spokespersons: 6 (21%) and 4 (14%) respectively; while the other 18 activities are widely spread among institutions. 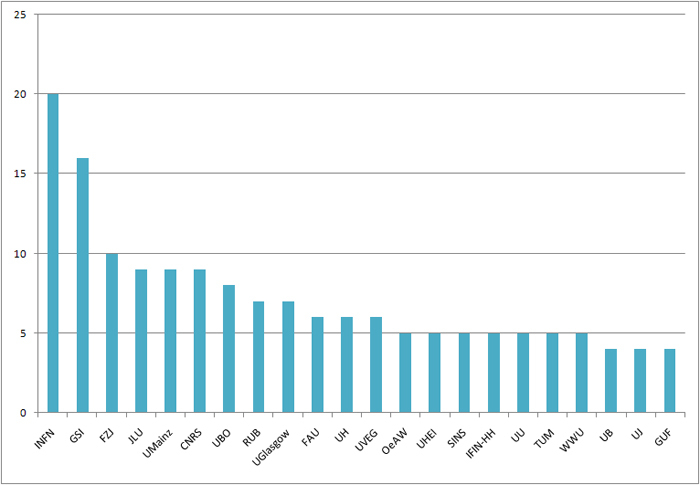 On the other hand, spokespersonship distribution among countries (Figure 2) is less widespread since German institutions lead half of the activities (50%), and Italy a quarter of them (25%), while the remaining quarter is divided by 4 nationalities. 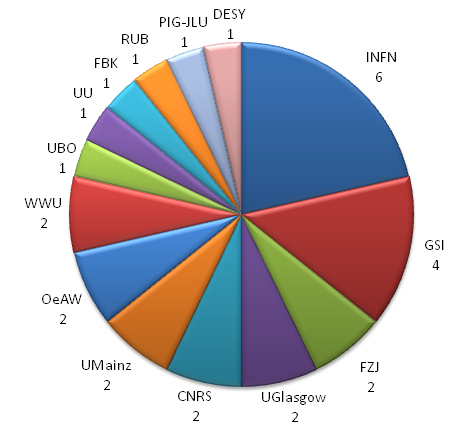 Figure 3 shows the work packages distribution among beneficiaries: INFN is involved in 21 different work packages (75%); GSI in 16 (57%); FZJ in 10 (36%); the University of Giessen and the University of Mainz in 9 (32%); the University of Bonn in 8 (29%) while CNRS and Glasgow University in 7 (25%); and so on. 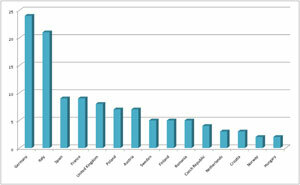 From this analysis it is also possible to determine the the work packages distribution among countries (Figure 4). 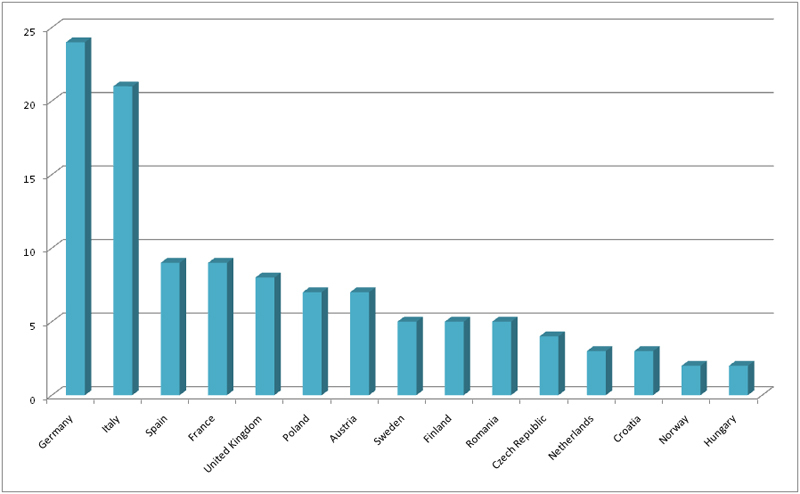 In this respect, German institutes are involved in 24 work packages (86%); Italian ones in 22 (79%); Spanish organizations in 10 (36%), French and Polish institutes in 8 work packages (29%); British and Austrian organizations participate to 7 activities (25%); Swedish and Finnish to 6 (21%); Romanian institutes participate to 5 work packages (18%), while Czech to 4 (14%), and Norwegian, Dutch and Croatian ones to 3 (11%); finally, Hungarian institutes participate to 2 activities (7%). The procedure adopted to organize the scientific work follows the bottom-up approach: each collaboration proponent of a Networking or a Joint Research Activity elects a spokesperson; for each institution involved in the collaboration an activity leader is appointed, who is responsible towards the spokesperson. The projects are formulated according to a series of tasks and subtasks, which are assigned to the participants according to their specific expertise. For each task milestones and deliverables are clearly formulated. Exchange of postdocs, regular meetings and periodical workshops will allow access the progress and if necessary adjust the schedule.